Podaris supports integration with Google Sheets, allowing you to export data from your projects and perform computations. The output of these computations can be visualised and presented as charts within Podaris: Plan, allowing stakeholders to easily interpret data derived from the modelling of multiple scenarios. Access to this raw project data allows for further analysis using your preferred tools, and synchronisation between Podaris and Sheets means that changes in your project are reflected automatically. 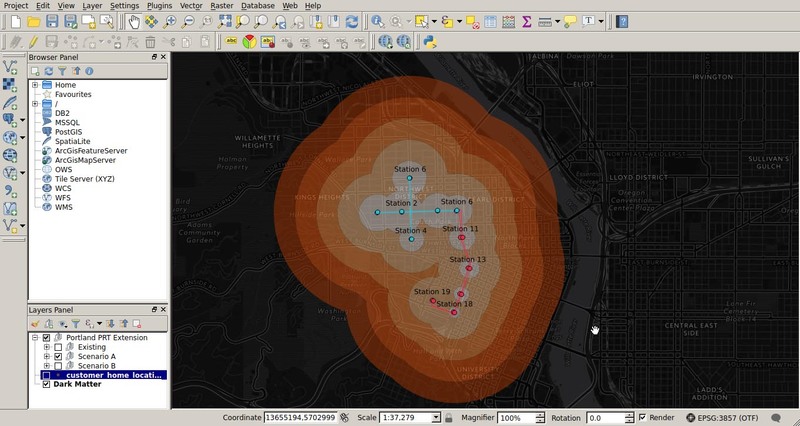 Leverage the power of QGIS, the leading open source Geographic Information System. Our QGIS plugin allows users to import project data such as route geometry, stations and pinned isochrones. Once imported, QGIS provides a wealth of possibilities for analysis using its highly expansible toolkit. The Podaris QGIS plugin offers a powerful way to compare scenarios by importing multiple views and performing sophisticated geospatial queries on your data.